For our second assignment in Advanced Techniques in Photojournalism, we shot portraits of a classmate in the studio. This was my first time configuring lights with a subject in a studio environment, and I must admit that I didn’t really enjoy it. By no means was that my partner Calin‘s fault. Calin was a great partner — very patient and, even though he’d also never done studio work before, more knowledgeable about how to set up the lights according to the desired light ratio. But before I delve more into why I didn’t enjoy the studio as much as I’d anticipated, here are the final three selects, of the 103 that I shot over two days. Calin Ilea playfully swipes his hand across his face to the tune of imaginary music. Ilea, a graduate student from Romania, enjoys playing soccer in his free time. Friday, Feb. 13. Ilea also enjoys the combination of pickles and mayonnaise, at least according to his friend and TA Catalin Abagiu. Friday, Feb. 13. Ilea sprawls out on the floor after nearly five hours in the studio on the second day of shooting. Ilea had already had a rough day before starting work in the studio at 9 p.m. Tuesday, Feb. 17 -- but, technically, Wednesday, Feb. 18. Light setup for the first two shots. And here's the light setup for the third shot. As you can see, these were pretty basic light configurations. I did play around with other setups — which is evident if you look at my outtakes (which will NOT be available on-line because that’s just silly) — but oh well. My comfort level in the studio is definitely not quite “there” yet. What I’m more used to is being thrown into a tough environment and having to work that situation until I produce great photos that (hopefully) exceed others’ expectations. Example? The tough, dirty places from which people don’t expect great photos to emerge. Political rallies, sports matches, concerts and other predetermined events where access is limited, which forces you to get creative. Access at this Hillary Clinton event and other candidates’ primary campaign events was absolutely wonderful, especially when compared to the terrible access at general election campaign rallies. 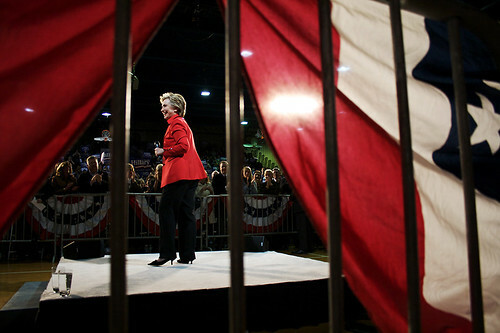 But I didn’t want to come out of the rally with the stereotypical “Hillary speaks” photo. So I wandered the gym and found this spot outside the barricade — a convenient spot because a) the attendees’ bleachers were far enough away that I didn’t block anyone’s view and b) the other photographers kept themselves restricted to the risers and didn’t use this vantage point. This is one of my favorite examples of how challenging and fun it is to have to work a situation and come out with a decent shot. At any rate. My point is, I’m really glad I’m learning how to shoot in the studio as part of my Advanced Techniques class. And I’m going to spend more of my own free time in the studio so I can better acquaint myself with it and become more comfortable there (although, not during periods when the studio is in high demand). But I’m just not destined to do studio photography, especially as a living.